Should you find yourself in or near Hartford, Connecticut, make time for the Mark Twain House & Museum. I visited last week and was awed by its beauty. 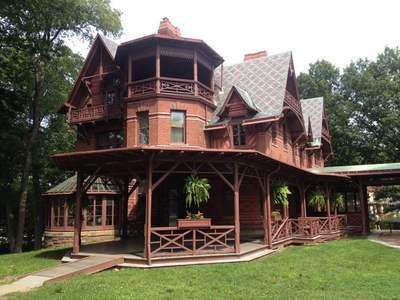 Twain (or Clemens) and his wife, Livy, relocated to Hartford in 1871 and engaged architect Edward Tuckerman Potter to design the 25-room abode. They moved in three years later. Even if you--or members of your travel party--have only read one Twain novel, back in high school, the house alone will delight. One sign I noticed called it 'America's Downton Abbey.' Not quite, but you get the point. But it's the billiard room that best evokes Twain the writer, in my opinion. Up on the third floor, the large room is dominated by a billiard table--one that was actually owned by Twain--but tucked into the corner is a desk where the author wrote his most famous books, including The Adventures of Tom Sawyer, Life on the Mississippi, and The Adventures of Huckleberry Finn, among others.